We’re building real business on OpenStack. This seems especially true in Asia where the focus is on using the core not expanding it. At the same time, we’ve entered the “big tent” era where non-core projects are proliferating. OpenStack summits are really family reunions. While aunt and uncles (Vendors) are busying showing off, all the cousins (Projects) are getting re-acquainted. Like any family it’s fun, competitive, friendly and sometimes dysfunctional. There are real deployments of OpenStack and real companies building businesses around the code base. I’ve been pleasantly surprised by the number of people quietly making OpenStack work. Why quietly? It’s still more of a struggle than it should be. There’s no such thing as a mono-lithic cloud. Even within the community, Monty’s Shade API normalizer, is drawing attention. More broadly, everyone is using multiple cloud platforms and the trend accelerates due to container portability. Containers are dominating the cloud discussion for good reasons. They are pushing into OpenStack at the top (Platform), bottom (Deployment) and side (Scheduler). While OpenStack must respond architecturally, it’s not clear yet if it can pivot from virtualization focused to something broader fast enough (Mesos?). The lightweight DevOps tool seems to be winning the popularity contest. It may not be the answer to all problems, but it’s clearly part of helping solve a lot of them. Warning: Ansible complexity explodes on multi-tiered, scale and upgrade orchestration. Both efforts have crossed from a concept into decision-making bodies within the community. The work is far from over. DefCore needs users to demand compliance from vendors. Product WG needs developers to demand their management sign on to PWG roadmaps. There are a lot of ways to consume OpenStack. None of them are wrong but some are more aligned with individual vendor strategies than others. Saying one way to run OpenStack is more right is undermining our overall operability and usability objectives. We’ve created a very commit economy and summits are vendors favorite time to brag about their dedication to community via upstreaming. These metrics are incomplete at best and potentially destructive to the health of the project as vendors compete to win the commit race instead of the quality and ecosystem race. We’ve officially entered the “big tent” era of OpenStack. This governance change was lead by the Technical Committee to address how we manage projects; however, there are broader user, operator, vendor and ecosystem implications. Unfortunately, even within the community, the platform implications of a loosely governed, highly inclusive community not completely understood. Overall, I left Tokyo enthusiastic about OpenStack’s future as a platform and community; however, I also see that we have not structured how we mingle platform, community and ecosystem. This is especially true because OpenStack is just a part in the much broader cloud market and work outside OpenStack is continue to disrupt our plans. As a Board member, I’ll hoping to start a discussion about this and want to hear your opinions. 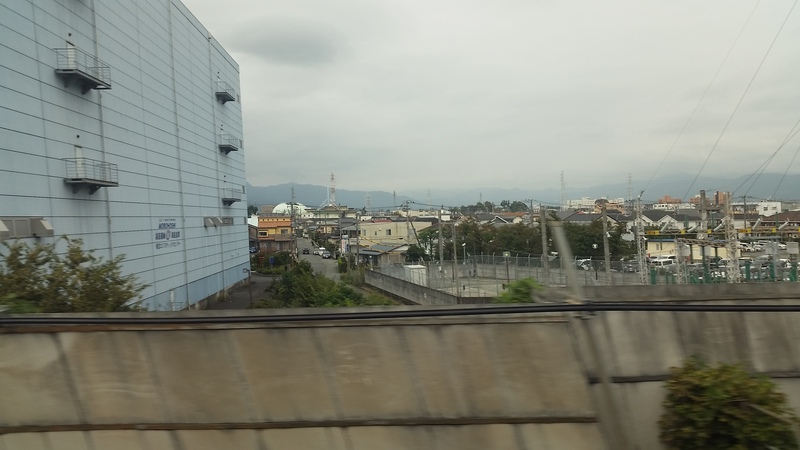 I was in Japan before the Tokyo summit on a bullet train to Kyoto watching the mix of heavy industry and bucolic mountains pass by. That scene reflects an OpenStack duality: we want to be both a dominant platform delivering core cloud services and an open source values driven collective. First, I fundamentally believe in the success of OpenStack as the open virtual infrastructure management platform. I believe that we have solved the virtual compute/storage/network problem sufficiently to become the de facto open IaaS platform. While not perfect, the technologies are sufficient assuming we continue to improve ease of use and operational hardening. Pursing that base capability is my primary motivation for DefCore work. In the presence of Amazon, VMware, Microsoft and Google, we cannot make that claim with any degree of self-respect. Even newcomers like DigitalOcean have an undeniable footprint and influence. Those vendor platforms drive cloud ecosystems and technologies which foster fast innovation because there is no friction to joining their ecosystems and they are sufficiently large and stable enough to represent a target market. We’ve seen clear signs from Rackspace, HP and others that platform diversity improves cloud strength. I continue to think we (OpenStack) spend too much time evaluating what is “in” or “out” of the project and too little time talking about what’s “on,” “under” and “with” the project like Kubernetes, Mesos, Docker, SDN, Hadoop and Ceph. That type of thinking creates distance between OpenStack efforts and the majority of the market. What motivates the drive to an all open captive community? It’s the reasonable concern that critical parts of the infrastructure will become pay-to-play. For example, what if a non-OpenStack alternative to Heat Orchestration gained popularity for OpenStack implementers. Perhaps something that ran on Amazon also. That would create external pressure that would drive internal priorities. These “non-OpenStack” products would then have influence without having to contribute back to upstream. Can we afford to have external entities driving internal priorities? Hell yes, that’s what customer adoption looks like. OpenStack does not own the market sufficiently to create cloud echo chamber. The next wave of cloud innovation (my money is on container platforms) will follow the path of least resistance and widest adoption. We need to embrace that these innovations will not all be inside our community so that we can welcome them as part of our ecosystem. The community needs to find peace with that. Watching the lovefest of DockerConf last week had me digging up my April 2014 “Can’t Contain(erize) the Hype” post. There’s no doubt that Docker (and containers more broadly) is delivering on it’s promise. 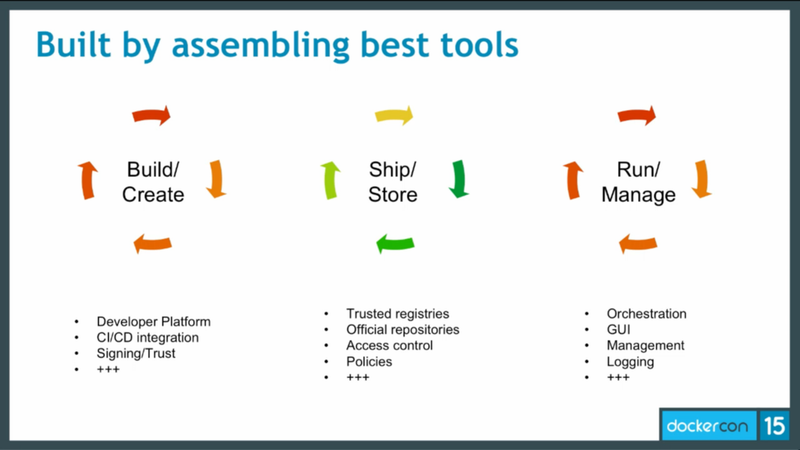 I was impressed with the container community navigating towards an open platform in RunC and vendor adoption of the trusted container platforms. I’m a fan of containers and their potential; yet, remotely watching the scope and exuberance of Docker partnerships seems out of proportion with the current capabilities of the technology. The latest update to the Docker technology, v1.7, introduces a lot of important network, security and storage features. The price of all that progress is disruption to ongoing work and integration to the ecosystem. There remains a confusion between Docker the company and Docker the technology. 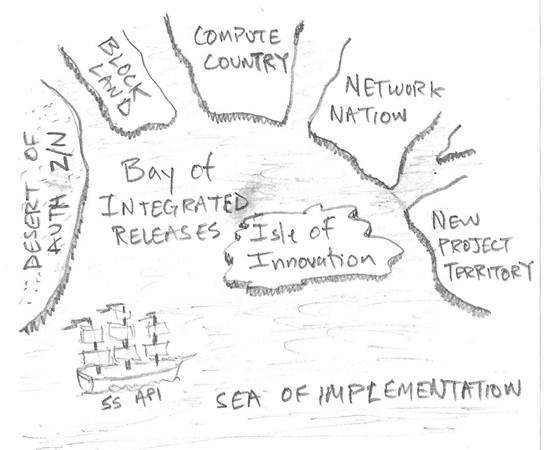 I like how the chart (right) maps out potential areas in the Docker ecosystem. There’s clearly a lot of places for companies to monetize the technology; however, it’s not as clear if the company will be able to secede lucrative regions, like orchestration, to become a competitive landscape. While Docker has clearly delivered a lot of value in just a year, they have a fair share of challenges ahead. If OpenStack is a leading indicator, we can expect to see vendor battlegrounds forming around networking and storage. Docker (the company) has a chance to show leadership and build community here yet could cause harm by giving up the arbitrator role be a contender instead. One thing that would help control the inevitable border skirmishes will be clear definitions of core, ecosystem and adjacencies. I see Docker blurring these lines with some of their tools around orchestration, networking and storage. I believe that was part of their now-suspended kerfuffle with CoreOS. Thinking a step further, parts of the Docker technology (RunC) have moved over to Linux Foundation governance. I wonder if the community will drive additional shared components into open governance. Looking at Node.js, there’s clear precedent and I wonder if Joyent’s big Docker plans have them thinking along these lines. The OpenStack Foundation Board has been having a broadening conservation about this topic. Feeling left out? Please don’t be! Now is the time to start getting involved: we had to start very narrowly focused to avoid having the discussion continue to go in circles. As we’ve expanding the dialog, we have incorporated significant feedback to drive consensus. No matter where I go, people are passionate about the subject of OpenStack Core. 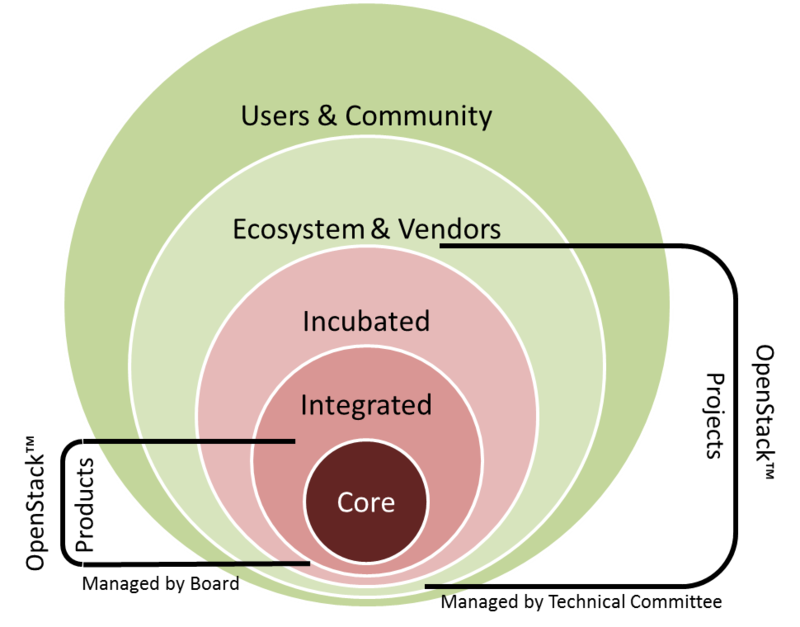 Overall, there is confusion of scope covered by “what is core” because people bring in their perspective from public, private solution, ecosystem or internal deployment objectives. In discussion, everyone sees that we have to deal with issues around the OpenStack mark and projects first, but they are impatient to get into the deep issues. Personally, we can get consensus on core and will always have a degree of healthy tension between user types. The following are my notes, not my opinions. I strive to faithfully represent a wide range of positions here. Clarifications, comments and feedback are welcome! Reference/Alternate Implementation (not plug-in): Not using “plug-ins” to describe the idea that OpenStack projects should have a shared API with required code and clearly specified areas where code is replaceable. It is the Technical Committee (TC) that makes these decisions. The most meaningful language around this point is to say that OpenStack will have an open reference implementation with allowable alternate implementations. Alternate implementations are useful: We want to ensure upstream contribution and collaboration on the code base. Reference implementations ensure that there’s a reason to keep open source OpenStack strong. Alternate Implementations are important to innovation. Small vs. Large Core: This is an ongoing debate about if OpenStack should have a lot of projects as part of core. We don’t have an answer but people feel like we’re heading in a direction that resolves this question. Everyone likes tests: We’re heading towards a definition of core that relies heavily on tests. Everyone expresses concerns that this will place a lot of stress on Tempest (or another framework) and that needs to be addressed as we move forward. Monolithic vs. Granular Trademark: We did not discuss if vendors will be able to claim OpenStack trademarks on subcomponents of the whole. This is related to core but wide considered secondary. 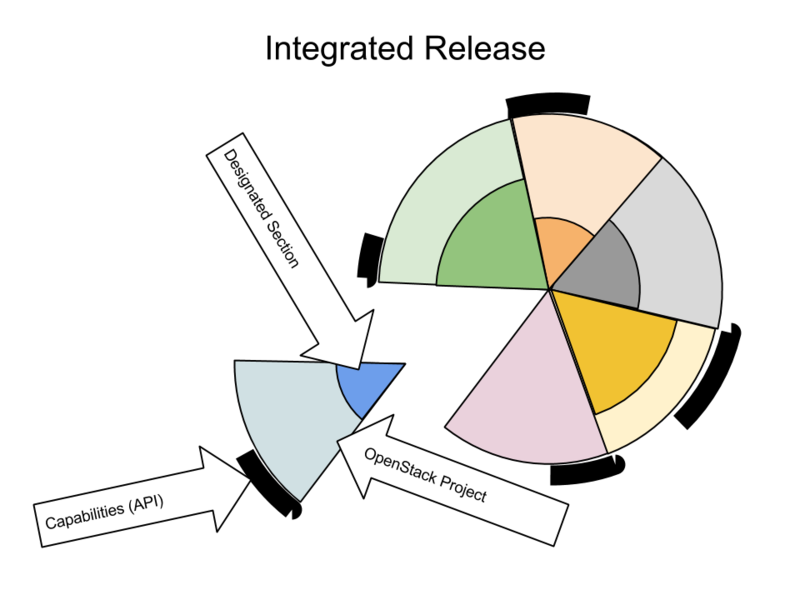 API vs. implementation tension: We accept that OpenStack will lead with implementation. There’s no official policy that “we are not a standards body” but we may also have to state that tests are not a specification. There’s a danger that tests will be considered more than they are. What are they? “They are an implementation and a source of information. They are not the definition.” We expect to have a working model that drives the API not vice versa. Brouhaha about EC2 APIs: It’s not clear if defining core helps address the OpenStack API discussion. I hope it will but have not tested it. Usability as core: I had many people insist that usability and ease of use should be as requirements for core because it supports adoption. Our current positions do not have any statements to support this view. Toxic neighbors: We have not discussed if use of the mark and criteria could be limited by what else you put in your product. Are there implementation options that we’d consider toxic and automatically violate the mark? Right now, the positions are worded that if you pass then you play even if you otherwise stink. Which tests are required? It appears that we’re moving towards using must-pass tests to define the core. Moving towards tests determining core, we want actual field data to drive which tests are required. That will allow actual user experience to shape which tests are important rather than having it be a theoretical decision. There’s some interest in asking the User Committee (UC) to recommend which tests are required. This would be an added responsibility for the UC and needs more discussion. Need visualization: With 12 positions so far, it’s getting hard to keep it all together. I’ve taken on an action item to create a diagram that shows which statements apply to which projects against the roles of ownership. I’ve had some great discussions about core and am looking forward to many more. I hope these notes help bring you up to speed. As always, comments and discussion are welcome!